I grew up in Montclair, New Jersey. My mom was a school librarian, who taught me to love good books. My dad was a newspaper editor, who taught me to write clearly and accurately. 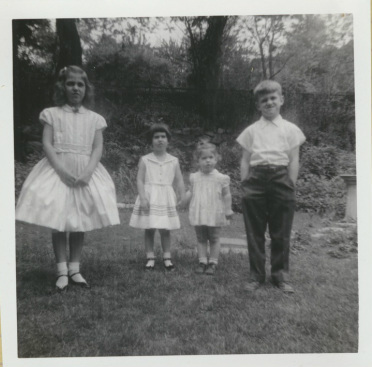 Here I am with my brother and sisters. I'm second from the right. Being the youngest taught me to love being the center of attention. I can't remember a time when I didn't want to be a writer. Even before I was very good at putting words down on the page, my favorite thing to do was make up stories. When I was in the first grade, my teacher Miss Hogan, invited me to tape record a story I'd made up about a little boy on Christmas morning. 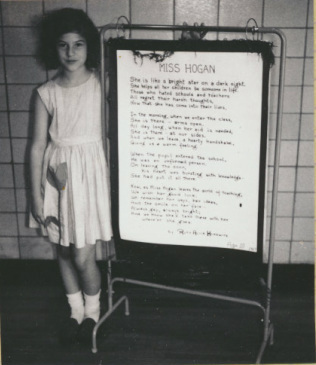 Here I am at 10, with a poem I wrote for Miss Hogan when she retired from teaching. Just about about anything that's fun to do alone is even better when you share it with friends. My friend Laurie and I used to sit in a tree in her backyard, writing cowboy and space travel stories starring her ten cats. When I was a little older, my friend Roma and I wrote a book together about a group of kids living on an enchanted island. We called it The Story. 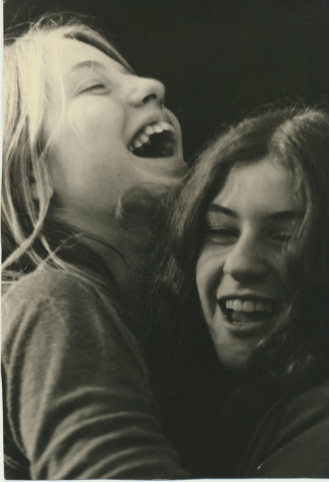 Here we are when we were in high school -- no longer writing The Story, but still best friends. Throughout my life, lots of people have encouraged me to keep writing -- and told me when things didn't work. That hasn't always been easy to hear, but it has helped me be the best writer I can be.